For many people, a new year brings a list of resolutions—those things we tell ourselves we’re going to do over the next twelve months. Unfortunately, as the weeks go by, many resolutions get pushed aside by lists of a more mundane persuasion: to-do lists. In fact, keeping track of everyday tasks can become an undertaking in and of itself (witness the popularity of Getting Things Done-like time-management systems). For those of us who spend much of each day using a computer, an effective onscreen to-do program can be a big help. A few years back, I reviewed ToDo X, which I liked because of its easy-to-use interface and its flexibility. But as a standalone list tracker, one of its major limitations was that it didn’t integrate with OS X’s own to-do-list features—then found in iCal and now, under Leopard, in both iCal and Mail. Anxiety gives you a simple, semi-transparent window, containing a list of tasks, that floats over all other windows. (If you prefer, you can instead choose to have the window visible only when Anxiety is the frontmost program. Alternatively, clicking on Anxiety’s menu-bar icon hides and shows the window.) Click on the checkbox button to add a new task to the list; check the box next to a task to mark it as completed and remove it from the list. That’s standard fare for a to-do list program. 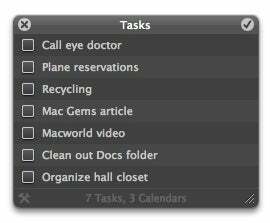 What sets Anxiety apart from most OS X to-do applications is that Anxiety’s list is automatically synchronized with the To Do lists in Leopard’s iCal and Mail programs. When you check off an item in Anxiety, or create a new task, those changes are instantly reflected in the other programs. And syncing is a two-way process; for example, if you create a new task in iCal or Mail, it appears in Anxiety’s window. This integration with Leopard’s Calendar Store also means that tasks in Anxiety each belong to a particular calendar in iCal; you can choose the calendar to which a new task will be synced when creating the task in Anxiety. You can even create a new iCal calendar from within Anxiety when creating a new task. 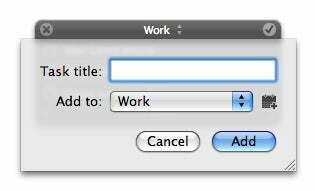 And double-clicking on a task in Anxiety reveals it for editing in iCal or Mail (you choose which via Anxiety’s preferences). You can also choose whether to view tasks from all iCal calendars at once or just those from a particular calendar; if you choose the latter option, a pop-up menu at the top of the Anxiety window lets you quickly switch to another calendar. This is convenient, although I wish there was a way to quickly toggle between the all-calendar and single-calendar modes without having to open the Preferences window. I’d also like to be able to glance at the list of tasks and see each task’s host calendar; for example, Anxiety could color-code each task to its iCal calendar color or list the calendar name next to each task. Anxiety also provides a number of useful keyboard shortcuts—listed in Anxiety Help—that let you use most of the program’s features without moving your hands from the keyboard. Although, oddly enough, neither Escape nor Command+. function as Cancel in Anxiety’s dialogs. Those accustomed to full-featured to-do programs will find a number of common features missing from Anxiety. For example, two bits of info absent from Anxiety’s display are each task’s priority as well as the due date for those tasks that have such a date assigned. Tasks are simply sorted by priority, regardless of due dates or any manual re-ordering you may have done in iCal or Mail. And you can’t change priority, sort order, or the calendar to which a task belongs from within Anxiety’s window; you have to make these changes in iCal or Mail. Thankfully, changes made in those programs are immediately reflected in Anxiety, but considering that a major reason you’d use something like Anxiety is so you don’t have to have iCal or Mail open, it would be useful to have some basic editing functionality built-in. I’d also like to be able to view completed items in Anxiety. Once you check an item’s box to indicate that you’ve completed the task, it disappears from Anxiety’s list and there’s no way to view it again without manually going into iCal or Mail and unchecking the box. Still, the folks at Model Concept would likely argue that Anxiety is supposed to be an elegant, no-frills way to keep your to-do list handy, and in that respect Anxiety succeeds—perhaps better than any other to-do program I’ve used. It doesn’t have as many features as ToDo X or other products, but it serves its intended purpose well: It’s just noticeable enough that you don’t forget about your tasks, but it doesn’t dominate your screen or require you to switch back and forth between your to-do list and other applications. Anxiety 1.0 requires Mac OS X 10.5 or later.